Eric Zener, Splash Portrait 5 Julie, 60 x 70. 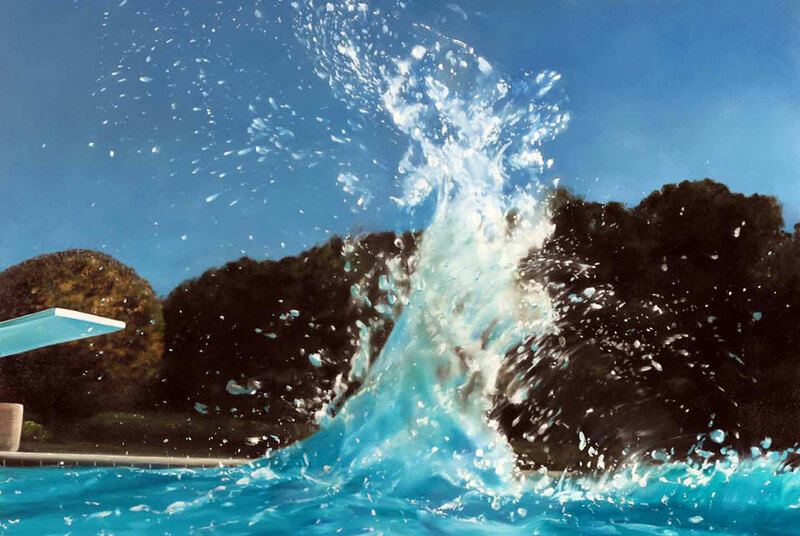 SAN FRANCISCO, CA.- Hespe Gallery is exhibiting oil paintings by the Bay Areas own, Eric Zener. The exhibition will continue through October 31. Transcendental ideas have always been important for Eric Zener to explore. Renowned for his oil paintings of swimmers in vivid blue water, Zener is moving in a new direction with these most recent works. He injects the introspection and solitude from his previous works into this recent series, but takes it a step further, drawing inspiration from Henry Thoreaus Walden and delving further into the human psyche. Zener challenges us to explore and rejuvenate ourselves in a more subjective way by removing the human presence from each scene. Walden, an oil painting that depicts a lush green thicket of trees within the depths of a forest, permits us a moment to ourselves and we come to realize how powerful the effects of nature truly are. Without any intended narrative from the artist, the viewer is allowed to superimpose his or her self into these natural environments, which serve as metaphors for personal transformation, refuge and renewal. With these pieces, Zener harkens back to the artistic ideals of the Barbizon School and the Hudson River School, but the photo-realistic quality of his works and focus on more intimate scenes draw attention to the silence and clarity we can encounter within the grandeur of the natural world. By re-creating the human experience in nature, Zener offers us solace from the ebb and flow of day-to-day life and a chance to experience natures calming and inspiring presence. Born in Astoria, Oregon, Eric Zener, 43, received a BA from the University of California, Santa Barbara. After traveling for several years, Eric moved to the Bay Area, where he lives and paints. Zeners work has been exhibited internationally in Australia, Japan and Spain and is included in numerous corporate, private, and museum collections. His work has been featured in the Robb Report, Juxtapoz, Art & Antiques, Travel & Leisure, New American Paintings, New York Magazine, The San Francisco Chronicle and ArtNews Magazine. He has exhibited at Hespe Gallery since 1994.